A sense of timelessness can make a building or home remarkable. I recently visited a large project I completed decades ago. As a suburban retirement community, its purpose doesn’t conform to the more standard principles of smart growth, which include mixed demographics and walkability. 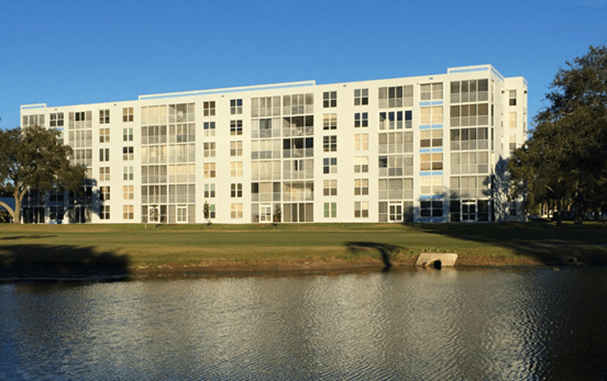 However, the 700-unit senior community in Bradenton, Florida, is environmentally conscious even by current standards. Valid for moderately priced housing today, it expresses a simplicity and beauty that transcend time. On this return journey, I noticed qualities of place that I had never realized were so compelling. The design used green building principles and created a sustainable environment. My client bought a half-finished development with older condos that had not met their potential, thereby saving energy by renovating and reusing. Built with an economical reinforced concrete slab system that accommodated 40 to 50 units in simple four or six story rectangular structures, the new construction has a small carbon footprint. 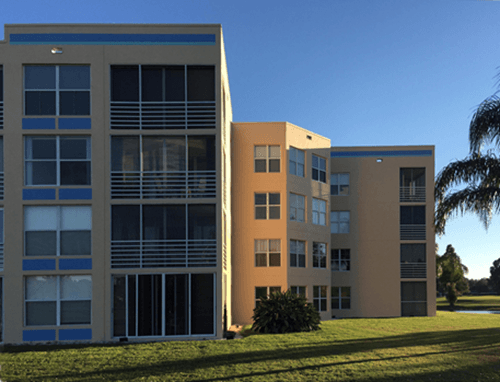 The modern forms, even more in tune with today’s aesthetic than when they were built, articulate functional Florida living with screened lanais, convenient private benches at unit entrances, and generous, well-proportioned windows. The light colors of the buildings reflect the sun’s rays, reducing air conditioning loads. Accents are in a varied Florida color palette, which ties the development to its region. The lyrical sense of place here derives largely from how the land planning responded to the natural environment. The buildings form quads around covered parking structures; each courtyard is unique and creates a sense of identity within the larger community. We renovated the surrounding golf course, planning both the links and the building quads to maximize views from the condos to the water features and vegetation. Punctuating the views are several one story community and recreation centers, deriving their forms from the low pitched metal roof Florida vernacular. Through architecture, Julia Miner, AIA, NCARB brings stories to life. The Principal of East Side Studio Architects in Concord, MA, Julia’s design work responds, first and foremost, to her clients’ hopes and dreams. She weaves that individual story into the greater context of local climate, topography, materials and culture. She has coined the term The Poetry of Place,™ to explain this process of distilling a myriad of conditions and narratives into an efficient, artful building design. Historic preservation and renovation have been a specialty — exploring the narrative of the setting and the people and creating spaces and forms that respond to modern lifestyles. As a Renaissance woman, Julia is a leading voice in the architecture and art community. She has been featured in AIA Voices, Metropolis Magazine, the Arizona Republic, the AIA Journal Drawing Awards, and various book reviews. She has taught planning, architecture and drawing at the college level and given book talks and workshops in schools throughout New England and the Southwest. Prior to starting her career, Julia joined the first class with women admitted to Dartmouth College and earned a Master of Architecture at Yale; afterward, between working for award-winning architecture firms in Connecticut, New York and Boston, she gained inspiration from her travels to Europe and the Middle East. In 1990, she moved to a historic adobe house in Arizona. While starting a family, she delved into architecture projects, paintings, book illustration, and teaching at ASU. After a decade, Julia returned to Massachusetts where she has continued to create a poetic sense of place through her design work.